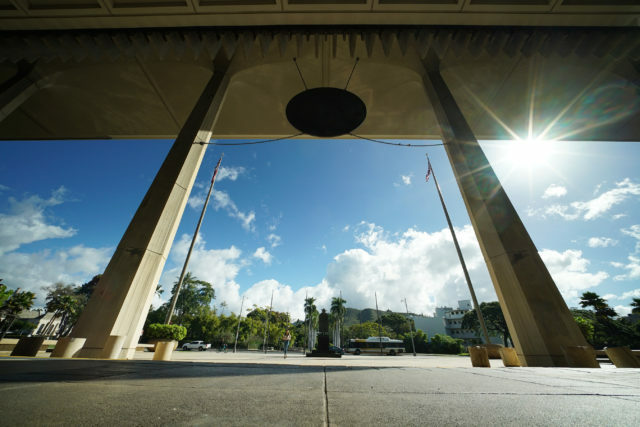 When Hawaii’s Capitol was dedicated in 1969 it was praised for its welcoming architecture. It is the only Capitol building in the United States that is open on all sides. Now some lawmakers are calling for more security in the wide-open structure. They say it’s long overdue in today’s era of terrorism and mass shootings. Rep. Chris Lee authored the bill that proposes the installation of metal detectors to screen for weapons and vehicle barriers and for a plan to eventually move all public parking out of the Capitol basement to a new above-ground parking structure to be constructed away from the Capitol. Lee’s bill to prohibit public parking inside the Capitol and to install roadside barricades is to prevent incidents like the drive-up bombing of Oklahoma City’s Alfred P. Murrah Federal Building in 1995. 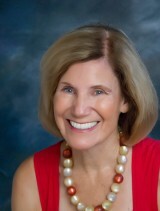 Attorney Margie Au regularly walks to the Capitol from her downtown office. She opposes the idea of large-scale security modifications to the historic structure. 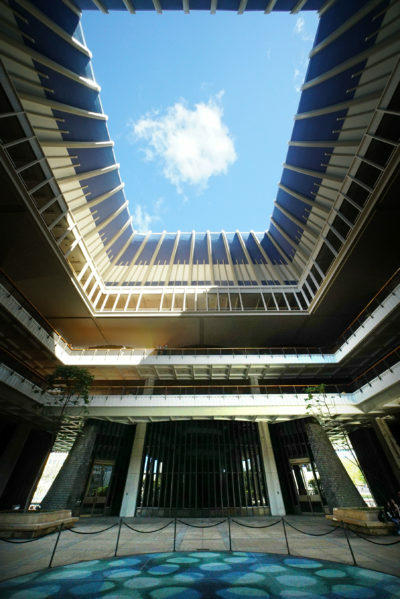 The Hawaii Capitol has an open floor plan and architectural elements aimed at welcoming residents and visitors. Lee’s bill was approved by the House last month but it is stalled in the Senate, where a few key senators think it goes too far. Taniguchi says he regularly discusses security at the Capitol building as the Senate’s appointee to the State Capitol Management Committee, a group of government officials and lawmakers who meet to discuss issues affecting the Capitol. Taniguchi says security can be tightened by upgrading the building’s security cameras with more modern coordinated camera technology to be overseen by professionally trained security officers in a separate room. Even though Taniguchi and other senators refuse to hear his bill, Lee hasn’t given up. He says he hopes lawmakers will appropriate enough money in this year’s state budget to at least allow the state to begin installing barriers and metal detectors in the building. Lee says he is mindful of the need to preserve the historic beauty of the Capitol building while making security changes because he was an architecture major at Oregon State University before he decided to change his major to political science. House Minority Leader Gene Ward says the seriousness of the security threat at the Capitol is enough to justify gutting another bill to stick in the wording of Lee’s measure to keep the proposal alive during the session. The openness has brought benefits to many people for different reasons. In my case, it helped me cover the Legislature as a news reporter when I didn’t know what I was doing. When then-KITV news director Wally Zimmermann informed me two days before the 1989 legislative session that he was assigning me to be KITV’s reporter at the Capitol, I was scared. I rarely went to the Capitol and was unsure of how the lawmaking process worked. For the first few weeks, I survived by looking across the open rotunda to the open hallways to see where the experienced reporters like Robbie Dingeman and Elisa Yadao were going, and then I followed them, trying to look like I knew exactly what I was doing. Eventually, I figured out how to find news at the Legislature on my own. Looking up from the Rotunda at the Capitol gives a view of Hawaii’s wide blue skies. Many of the most famous architects in the world competed for the job of designing the Hawaii Capitol, including I.M. Pei, Frank Lloyd Wright’s Foundation, Minoru Yamasaki, Edward Durrell Stone and San Francisco architect John Carl Warnecke. Warnecke won the bid. He was internationally known for his design of the U.S. Embassy in Thailand and his master plan for Lafayette Square in Washington, D.C., and for designing President John F. Kennedy’s eternal flame gravesite. Warnecke was respected for his buildings that harmonized with their natural environment and cultural and historical settings, in an architectural style called contextualism. He worked in association with the Hawaii firm of Belt, Lemmon & Lo to design and build the Capitol in four years at a total cost of $27 million for site acquisition and construction. Architectural historian Don Hibbard has written a booklet called “Democracy By Design” about the planning and development of the Capitol. Like many state preservationists, Hibbard is concerned that the push to increase security will slowly eat away at the structure’s majesty. “It is a sad commentary on our society when our legislators feel they have to protect themselves from the citizenry,” says Hibbard. Kiersten Faulkner, the executive director of the Historic Hawaii Foundation, wonders what kind of threats the lawmakers are concerned about. The last two fatal shootings in the Capitol district were done by police officers and a state deputy sheriff­ — not terrorists. Faulkner says security could be increased at the Capitol without impacting the welcoming feeling of the building by erecting fences around the outside perimeter of the grounds — out by the road, not against the Capitol building itself. The state could also hire more deputy sheriffs to increase the feeling of security in the building. But Faulkner says before making big physical changes to the Capitol building, lawmakers first should be clear about the nature of the problem they are facing. Ward says it is pointless to keep stressing the open feeling of the architecture when it poses security risks.